Many consumers believe organics are healthier than conventional options, as studies show some organics contain more nutrients and significantly less pesticide residues that research suggests may be harmful to your health. “Should I buy organic?” As dietitians, you’ve probably heard this question from clients time and again. Given the higher cost of organic foods and new questions being raised regarding their health benefits, clients are right to ask. Despite these new questions, however, demand for organic products is growing. According to the Organic Trade Association’s (OTA) 2012 Organic Industry Survey, sales of food and nonfood organic products grew by 9.5% in 2011 to reach $31.5 billion.1 Of the 81% of families that said they bought organic food products, as part of the OTA’s newly released 2013 US Families’ Organic Attitudes and Beliefs Study, 48% said their primary motivation was the belief that organic products are a healthier choice for themselves and their children.2 But are organic foods, in fact, more healthful than conventional foods? While the Stanford analysis averaged crops from multiple years into a single data point, a 2011 review that looked at separate years as separate data points to account for the effects of weather came to a very different conclusion.6 The 2011 review, a meta-analysis conducted by scientists at Newcastle University in England, concluded that organic produce has a 12% higher content of secondary metabolites and a 6% higher vitamin C content than corresponding conventional samples.6 Secondary metabolites are phytochemicals that increase a plant’s ability to survive in its environment. Since organic plants are forced to defend themselves against disease and pests without the aid of manmade chemicals, they may develop more of these natural defenses. When examining the value of organic foods, it’s important to understand the definition of organic. In the United States, organic is a labeling term defined by the USDA. To be considered organic, a product must meet federal standards for production, processing, and certification under the Organic Food Production Act of 1990. The National Organic Program oversees these standards, which have been in full effect since October 2002. Moreover, the detrimental environmental impact of pesticide use should be taken into account. Air- or water-borne pesticides can deplete the ozone, harm or kill nontarget species and beneficial soil organisms, contaminate drinking water, or adversely effect marine life. When answering clients’ questions about organic foods, dietetics professionals clearly must take into account a definition of healthy that goes beyond nutrient content. “I think it’s important for RDs to discuss the whole situation about organics, not just nutrients. We should feel informed and empowered to discuss the entire food system in our conversations with people,” Palmer says. 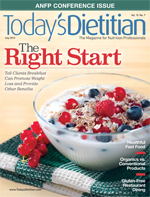 “Dietitians should be the experts in areas such as food sustainability and production. Otherwise people will turn to less informed people for information about organics.” For evidence-based information on organics, Palmer recommends the Hunger and Environmental Nutrition Dietetic Practice Group of the Academy of Nutrition and Dietetics (the Academy). Whether people buy organic or conventional, it’s the nutritional quality of the overall diet that matters. “The key is to enjoy a wide variety of foods, including fruits, vegetables, whole grains, lean protein, nuts, seeds, and beans,” Sheth says. “I advocate that people meet their fruit and vegetable servings as their primary goal,” Palmer adds, regardless of whether that produce is organically grown. • Wash your hands for 20 seconds with warm water and soap before and after preparing fresh produce to prevent the spread of bacteria. • Cut away any damaged or bruised areas before preparing or eating. • Wash produce with large amounts of cold or warm running tap water and scrub with a brush when appropriate. There’s no need to use soap or a produce wash.
• Wash produce before you peel it so dirt and bacteria aren’t transferred from the knife onto the fruit or vegetable. • Dry produce with a clean cloth or paper towel to further reduce bacteria that may be present. • Throw away the outer leaves of leafy vegetables such as lettuce and cabbage. • Trim the fat from meat and the fat and skin from poultry and fish. Residues of some pesticides concentrate in animal fat. 1. 7 tips for cleaning fruits, vegetables. US Food and Drug Administration website. http://www.fda.gov/ForConsumers/ConsumerUpdates/ucm256215.htm. Updated April 12, 2013. Accessed April 25, 2013. 2. Pesticide Q & A. US Food and Drug Administration website. http://www.fda.gov/Food/FoodborneIllnessContaminants/Pesticides/ucm114958.htm. Updated February 20, 2013. Accessed April 23, 2013. 1. Consumer-driven US organic market surpasses $31 billion in 2011. Organic Trade Association website. http://www.organicnewsroom.com/2012/04/us_consumerdriven_organic_mark.html. April 2012. Accessed April 18, 2013.
report.html. April 4, 2013. Accessed April 17, 2013. 3. Smith-Spangler C, Brandeau ML, Hunter GE, et al. Are organic foods safer or healthier than conventional alternatives? A systematic review. Ann Intern Med. 2012;157(5):348-366. 4. Is organic food really more nutritious? Tufts University Health & Nutrition Letter website. http://www.tuftshealthletter.com/ShowArticle.aspx?rowId=368. September 2007. Accessed April 19, 2013. 5. Schardt D. Going organic: what’s the payoff? Center for Science in the Public Interest website. http://www.cspinet.org/nah/articles/going-organic.html. October 2012. 6. Brandt K, Leifert C, Sanderson R, Seal CJ. Agroecosystem management and nutritional quality of plant foods: the case of organic fruits and vegetables. Crit Rev Plant Sci. 2011;30(1-2):177-197. 7. What is organic? United States Department of Agriculture website. http://www.ams.usda.gov/AMSv1.0/nop. Updated May 3, 2013. Accessed April 18, 2013. &acct=nopgeninfo. Updated April 4, 2013. Accessed April 18, 2013. 9. Global trends in healthy eating. Nielsen website. http://www.nielsen.com/us/en/newswire/2010/global-trends-in-healthy-eating.html. Updated August 30, 2010. Accessed April 21, 2013. 10. USDA National Organic Program, USDA Science and Technology Programs. 2010-2011 Pilot Study: Pesticide Residue Testing of Organic Produce. United States Department of Agriculture website. http://www.ams.usda.gov/AMSv1.0/getfile?dDocName=STELPRDC5101234. November 2012. 11. Curl CL, Fenske RA, Elgethun K. Organophosphorus pesticide exposure of urban and suburban preschool children with organic and conventional diets. Environ Health Perspect. 2003;111(3):377-382. 12. Parker-Pope T. Pesticide exposure in womb affects IQ. The New York Times website. http://well.blogs.nytimes.com/2011/04/21/pesticide-exposure-in-womb-affects-i-q. April 21, 2011. Accessed April 23, 2013. 15. Cephalosporin order of prohibition goes into effect. US Food and Drug Administration website. http://www.fda.gov/AnimalVeterinary/NewsEvents/CVMUpdates/ucm299054.htm. April 6, 2012. 16. Industry statistics and projected growth. Organic Trade Association website. http://www.ota.com/organic/mt/business.html. June 2011. Accessed April 18, 2013. 17. 10 reasons organic food is so expensive. FOX News website. http://www.foxnews.com/leisure/2012/03/11/10-reasons-organic-food-is-so-expensive/ - ixzz2RbCdXLXr. March 11, 2012. Accessed April 23, 2013. 18. EWG’s 2013 shopper’s guide to pesticides in produce. Environmental Working Group website. http://www.ewg.org/foodnews/summary.php. Accessed April 22, 2013. 19. Pesticide Q & A. US Food and Drug Administration website. http://www.fda.gov/Food/FoodborneIllnessContaminants/Pesticides/ucm114958.htm. Updated February 20, 2013. Accessed April 23, 2013. 21. Forman J, Silverstein J; Committee on Nutrition; Council on Environmental Health; American Academy of Pediatrics. Organic foods: health and environmental advantages and disadvantages. Pediatrics. 2012;130(5):e1406-e1415.